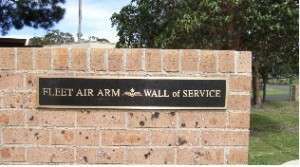 In 1991 an idea had been running around the head of Fleet Air Arm Association member Greg Wise that a brick wall in a “U” shape standing about 6 foot high should be constructed in the area of the memorial garden at the Australian Naval Aviation Museum, on which members could have a bronze plaque recording their time spent on RAN service. It was basically to record them being a “birdie” and having served in the Fleet Air Arm. The idea was raised at a NSW Division committee meeting to see how the rest of the committee regarded it. It was not something that created an uproar but it was not rejected. From that meeting onwards the idea started to develop. Drawings of an overall layout, a site plan, numerous designs of individual plaques and a naming plaque were put together by Greg and Neville Newbold. The latter operated an engraving business and it was here that they made the prototypes for the plaques. These were forwarded to a foundry in Victoria for comment and costing. By then it was early August 2004 and one year had passed since the conception of the idea. The management of the NSW committee changed around this time and these two found themselves on the committee – and once again their ideas were put forward as a proposal along with the plans they had put together. Quite a few changes were made to these plans. The height of the proposed brickwork was reduced to not above eye level to keep the site from looking like a ‘cell block’, and for convenience and simplicity of construction, the curves of the “U” were changed to 90 degree angles (the curves were originally designed to fit into the overall curved nature of the memorial garden itself). 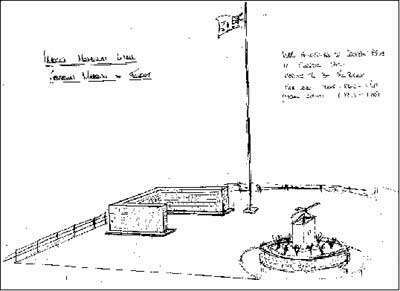 The site plan was also changed so this new shape fitted into an area which would leave the flag pole clear. From this drawing a plan was agreed and the plaque prototypes were reduced to a single option that encapsulated the required information in a format that was simple, neat and looked smart. It was also agreed that no nicknames or comments would be considered, in order to appear “Service Like”. A revised plan was then put forward that encompassed all the discussed alterations and it was accepted by the committee as a firm starting point. This was then presented to the Board of the Museum of Flight for approval but the response was less than favourable. Several approaches were made, but these also did not meet with approval. It appeared that the whole plan was doomed. Time passed and the subject simmered below the surface. Along with this proposal there was the turmoil of the fate of the Museum itself. It had been operating at a loss for some time and looked as if it may have to close if financial support could not be found. At one of the discussions about the whole situation, the idea of attracting more people to the museum because of family connections was raised by Greg Wise and as the Wall of Service was considered a chance to do this, it could be seen as assisting the museum. As no firm decision was made by the museum to continue the previous objections, the NSW committee accepted this as tacit agreement to proceed. Also, a firm stance on the fate of the museum was taking shape (a return to Navy control and ownership) and this made it essential that the format planned for the Wall would be such that it had to be something that would fit into a Service surround. The plans were again examined in this light and a firm set of guidelines were added that set out how, when, where and why a person would be eligible to have his name on a plaque on the Wall. This was considered essential so there would be no controversy at a later date about the appropriateness of a plaque on the Wall. The costings were formalised and an application form for a plaque produced. Distribution of this form was initiated among members of the local naval community. It was felt it was essential that the first plaques be affixed to the Wall as soon as possible just in case the attitude to the project changed. Construction of the brickwork began almost immediately (plans were already in hand) and within a fortnight (in March 2005) the Wall was erected. Along with the plans for the Wall, plans also had been under way with a firm that acted as agents in Southern NSW for a Melbourne foundry. These entailed a final draft for the plaque that would be used as well as a commitment from them to provide (free of charge) a large bronze ‘naming plaque’ for the Wall. The initial order sent to the foundry was for 91 plaques. This could have been for more but time was a factor and the organisers wanted the first of the plaques (and naming plaque) quickly established. It was obvious by the short time taken to get this many commitments that numbers taking up the proposal would be up to expectations. The organisers hoped to have about 200 plaques on the Wall by the time of the Fleet Air Arm’s 60th anniversary in October 2008, and after that they expected the rate to slow a little but still maintain a steady flow. The first plaques arrived in conjunction with the naming plaque and the process of affixing them started. The final result a few days later was very pleasing to the eye. (Decemb er 2014) Continuing additions of plaques to the Wall have up to this date come to more than 830 and continue at regular intervals. It has taken a long time to get news of the Wall out to everybody and just as long to get them to act, but every week more applications arrive and it is noticeable that quite a few serving members are having plaques added along with previous serving members (usually family). 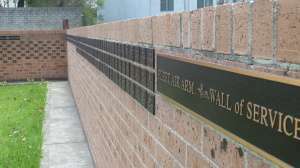 The rule that they are affixed in the order they are manufactured means that the names of naval airman are alongside admirals and this adds to the ‘familiarity’ of the Wall. The one exception is the lone plaque affixed to the end face of the Wall and this is for the ‘father’ of the Fleet Air Arm, Admiral Sir Victor Smith. With the front face of the Wall containing eight rows, it was decided to then make a start on the rear forward-facing side – this was merely to balance the appearance to avoid a lopsided look. The first row on this side is almost complete and applications keep coming at a regular rate. In all, there are spaces for about 14,000 so it will be a while before extensions will need to be considered.